Personalities define some bands. The unique talents of the three or four or five players, the frictions and the fusions, become inextricable to who and what the band is. That’s a simple truism, whether applied to the Beatles, the Band or the Jam. Remove a piece, and things fall apart. The War On Drugs is not that kind of band, according to Adam Granduciel. The group, at least on record, is a vision, a sound, a playing field. 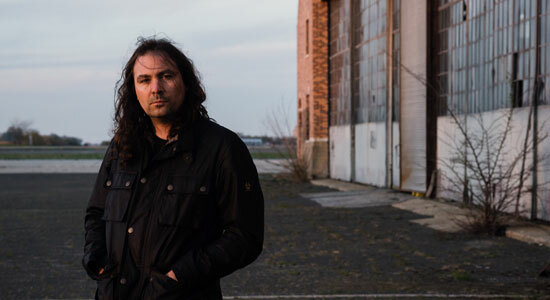 And A Deeper Understanding (Atlantic), the fourth War On Drugs full-length, expands the vision laid out on Lost In The Dream, the band’s 2015 breakthrough album, the one that took them from clubs to theaters to headlining New York City’s Radio City Music Hall and gave Granduciel and Co. the opportunity to jump to a major label. Although two of A Deeper Understanding’s 10 tracks feature the full complement of the War On Drugs touring band that has been in place for the last three years—bassist Dave Hartley, keyboardist Robbie Bennett, guitarist Anthony LaMarca, saxophonist/keyboardist Jon Natchez and drummer Charlie Hall—they’re supplemented by others. Granduciel and Hartley (who also helms Nightlands) are the only constants on every track on this album (and from the band’s start in 2005). Granduciel has always been a studio obsessive, going back to the days in Philadelphia when he and Kurt Vile played in each other’s bands and worked together on bedroom recordings. Later, for albums such as 2011’s Slave Ambient, his method was to sift through hundreds of hours of home recordings, looking for the best ideas, building layers of sound into dense, sweeping sonic landscapes, bringing in other players as needed. But Granduciel recorded most of A Deeper Understanding in Los Angeles, where he moved with his girlfriend in early 2016. (He’s since relocated to Brooklyn, although the band has a rehearsal space in Philly.) And although he still anchors all the tracks—the credits sometimes show him playing a one-man-band’s worth of instruments on a song—he prioritizes what individual players bring to the table. Six different drummers, for example, provide the backbeat over the course of the album. For a band known for its big guitar sound, the focus on drums could seem surprising, especially since War On Drugs songs tend to ride a steady rhythm—whether a leisurely, pulsing one for the 11 minutes of “Thinking Of A Place” (drummer: Hall), an accelerated, emphatic one for “Holding On” (drummer: Patrick Berkery) or a laid-back, thoughtful one on “The Strangest Thing” (drummer: Darren Jessee). On this album, the songs swell and flow. Granduciel’s decision-making process for who plays on what track is part skills-based, part trial-and-error, part serendipity. And although that experimental process works with the keyboards and guitars, it’s especially true with the drums and percussion. Granduciel loves working in the studio, and he knows he can go down a rabbit hole and have trouble letting go of a song. He’s a tinkerer, susceptible to analysis paralysis. For this album, after an initial month of excited recording, he spent four or five months tweaking ideas. “I was working on it and changing everything and never really breaking through and never really feeling like I was tapping into what I was trying to do,” he says. But then he took the recordings to New York and, working mainly on his own, finished the LP.